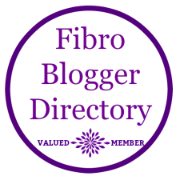 Please visit and check out some of the other wonderful blogs on the site and then be sure and comment and let Lee know how much we appreciate her hard work gathering up these quality fibromyalgia sites for us to reference. Don’t forget to follow her page while you are there!! Thank you Invisibly Me! Hopefully you guys will rub off on me, LOL.